A tract of land once held by one of the founding families in Dripping Springs is in the initial planning stages for development that, when complete, will significantly change the dynamic in the neighborhood. Since August, representatives of Austin-baed SEC, LLC, planning and architectural firm, have met with Dripping Springs Parks and Recreation Commission officials to build a housing development behind the Dr. 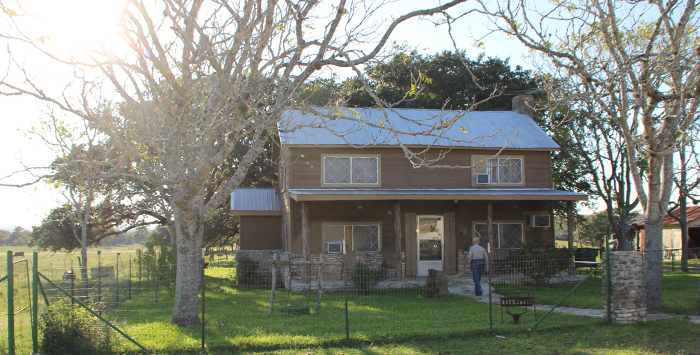 Pound Historical Farmstead and adjacent to Founders Memorial Park, said Michelle Fischer, Dripping Springs City Administrator. The tract of land, owned by William R. Scott, 84, is a seemingly open, never ending, prairie field, from the point of view of the Farmstead. Dr. Joseph Pound, who settled in the area in the early 1850s and is considered one of the founders of Dripping Springs, originally owned the tract. The land passed through many holders before being sold to John Ireland, Scott’s father-in-law, in 1942. His wife, Bessie Elaine Ireland Scott, grew up on the property and in 1964 they purchased the land. Scott would not disclose who the developer is because “I haven’t gotten the money yet.” However, he said the deal is expected to close in May 2018. It was about a year ago when a broker approached him about selling his property, including the home originally built in 1883, he said. “Well, I didn’t want to sell it . . . (Their offer) was enough that I couldn’t back out of it,” Scott said. The rapid development in the area and difficulty in finding available land to lease for his 96 head of cattle and sheep helped Scott make his decision. “Growth is always a difficult subject, but with such a large parcel of land, people would anticipate it being developed at some point in the future,” Ginger Faught, Dripping Springs deputy city administrator, said. How the development will affect the Pound farmstead is being looked at closely, Faught said. Representatives from the developers met with Friends of the Poundhouse Foundation, the organization that owns and runs the Farmstead property and museum, to ensure they take into account the ascetics of their development in relation to the farmstead, said Lisa Chaffin, member of the Friends of the Poundhouse Foundation. She told visitors of the Farmhouse during their annual Pioneer Day in September to take a good look around, enjoy the view, because it won’t look the same next year. In the past, efforts were made to preserve the field adjacent to the Pound House, but it never worked out, Chaffin said. The developer’s plan is still at “bubble idea,” since they have not submitted a concept plan to the city yet, a first step to final implementation of the development, Faught said. A public hearing will be held before the project breaks ground. The project must receive approval from several city departments, such as the Parks and Recreation Department and the city’s Transportation Committee, before being brought to the city council for a vote. Any approved plan will take into account the city’s plan to create a loop through the tract to bypass U.S.Highway 290, as described in the city’s transportation plan, Faught said. The development will also have implications for Founders Memorial Park. In preparation, the city is launching a Founders Memorial Park Advisory committee to create a master plan for the park. The committee will in part look at how its 40 acres will interact with the new development, Fischer said. The city has also hired a consultant to work with the committee to make recommendations for improvements in the park. The developers indicated wanting waste management services, which will require city annexation in order for the city to provide it, Fischer said. The city is limited in its ability to provide waste management services, which has caused a chokehold for development, Faught said. She expects the city’s request for a permit expansion from the Texas Commission on Environmental Quality (TCEQ) will be granted in time for the development. The upcoming wave of new families to the area also ties to talks for building a new school, Fischer said. For Chaffin, an upside to the expected development is the arrival of new families with children who she hopes will bring new visitors. With such a change in the landscape of the area, she said people could turn to the Farmstead as an anchor for what the community used to be.